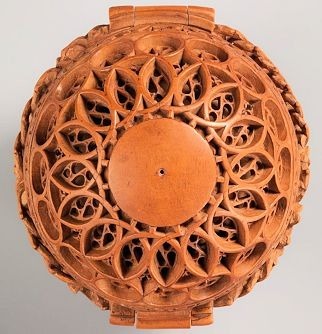 Just two inches in diameter, carved rosary beads that were made by artists in the Netherlands in the 16th century are amazing for their intricacies and details. Inside these little treasures are carvings of the miracles and stories of the Bible. The artistry seems as miraculous as the stories they depict. The ingenious techniques of the artists who created these masterpiece panoramas have awed people for centuries. Now, through this Virtual Reality video, you can pretend to shrink down to a tiny size and see the carved figures up close and in every detail. Imagine what it was like to pray with this type of rosary beads. Picking up, cradling, and opening up the prayer beads to see the biblical scenes inside is a very different experience from handling the rosaries that we’re to using. Enter into Virtual Reality to miniaturize yourself and see the amazing details of the carvings. See these carved rosary beads in Virtual Reality to get up close to their intricate carvings. This is a wonderful video to give to children as well as adults when teaching about using the Rosary as a meditation. Use it to break their habit of praying the rosary by rote. You can use this Virtual Reality homework assignment to help students experience the mysteries of the Rosary through their imaginations, visualizing each scene. Please share this post with the catechists you know. 1. How many angels can you count? 2. Find the scene that depicts hell. What are the demons doing? How do we know that hell is real? 3. Who is the man with rays coming from his head? Why is he above the scene of hell? 4. Who is the man wearing a crown, with rays coming out from him? What are the clues that this depicts heaven? Download the interactive PowerPoint Rosary from Catholic Digital Resources. It’s a visual way to lead groups through a meditation on the Luminous Mysteries of Christ’s mission. Preview it at catholicdr.com/powerpoint-packages/luminous-mysteries-of-the-rosary/. This entry was posted in VR Experiences on February 8, 2019 by Terry Modica.